If it was smaller and didn't have the goddamn turtle neck I would buy it. 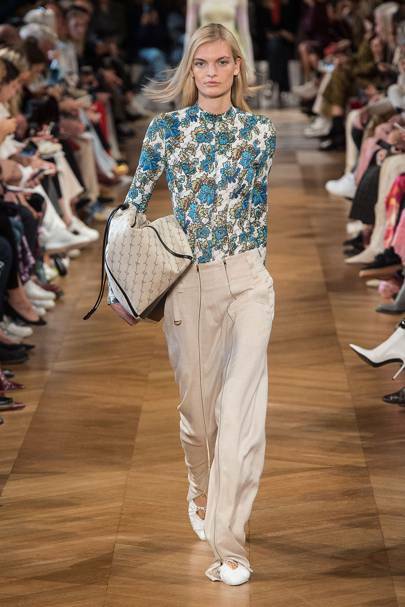 That's Stella's big runway problem IMO, practically everything she displays is oversized (cuffs going well below fingers, trousers edging the floor). Not flattering whatsoever. The girl trained at Savile Row, she knows a lot about tailoring, her women's suits are fabulous yet her models look like they're 3-year-olds dressing in mummy's clothes. A lot of her bespoke clothing is gorgeous yet her runway collections can be very much hit and miss (don't start me on her shoes, I've written here before about how I hate Stella McCartney shoes!!). That grey on the Yellow Sub tee is also a terrible choice. It's hard to not make a Yellow Sub shirt look tacky but she's managed to multiple it by 50 on the tackiness scale. But grey is the most psychadelic color there is! Clearly it was the perfect choice. You wouldn't mind but if she had gone full Hawaiian and made it a blue background or even a clashing-green, it would at least accept it's a stupid design and you'd be more willing to buy it for it's full-blown tackiness (and for showing you're a rich person). Also @TheWalrusWasBrian do you have the couple of hundred dollars that that t-shirt will cost? It'll surprise me if it's less than $300. "Oh, woman Stella, what have you done?" That cloud. Maybe I should have posted this in the 50 Shades thread. That's revolting for so many reasons, tho presumably the vile turtleneck is not part of the actual item. It's obviously going to be vastly overpriced and shoved in a wardrobe never to be adorned by whoever buys it. Out of interest, do any of the main items presented on the catwalk actually get worn by anyone as often they are impractical and hideous. Please excuse change of topic, but guy on Jeopardy right now looks like Sean. haha no i did not mean that literally. i'll stick with my less than ten bucks beatles Ts, thank you. It depends on what collection & designer you are looking at, Stella is a prêt-à-porter/ready-to-wear designer, what you see on the runway is what you can buy online and in shops. Others designers do both RTW and haute couture. These are about art rather than practicality, they show what the designer can do with the human body rather than showing wearable items. An excellent example is Alexander McQueen's (who was an absolute genius, if you ever want to watch a runway show for whatever reason, watch any McQueen from the '90's) 'La Poupée'- the doll. I don't have or see the problem. Stella has been so successful in her own right that any rumblings of favouritism due to or trading on her dad are petty. Apple would have been happy to allow such usage due to the publicity and prestige having a designer such as Stella using The Beatles. Both sides win. The losers are anyone who knows anyone who buys and wears them as they are all horrible. My problem, such as it is, @meanmistermustard, is that in previous examples of such clothing lines - eg. Pretty Green's White Album 50th Anniversary Collection in association with Apple - they have always had to have a Beatles reference within the Collection title and numerous Apple references all over the publicity. I'm never keen when someone is exempted from the usual terms and conditions just because of who they're related to. It's also disappointing that, after years of largely avoiding Beatles connections (she has done a few charity things that have played on Beatles imagery), within a year of buying her partner out and gaining full control of her business, she's going down the road of Beatles-themed collections. Maybe Apple saw the finished designs and decided that they were so hideous not even they wanted to put the Beatles references all over them. Anyway, I'm still on the side of not caring. I will say I think the shirt in the fourth picture and jacket in the sixth picture look pretty cool, but the others don't really interest me. Wednesday night (10 April), the Claypool Lennon Delirium playing the Danforth Music Hall in Toronto, joined by Rush bassist Geddy Lee, take on Tomorrow Never Knows for nine-and-a-half minutes!!!! So I guess you're officially a Rush fan, now, EH? Erm, no change. I've never suggested the members of Rush couldn't play their instruments, weren't to be admired for how well they could play their instruments, but have suggested that the music they wrote and performed, their canon, has never caught my interest. The above above is a cover of perhaps the hardest Beatles track to do justice to live, the drums alone being daunting enough. A nice spacey vocal and psych lead guitar from Sean, Les and Geddy trading bass, those drums mighty, the band slowly disappearing to roadies and feedback. Who's EH? I do prefer RN! Ha just kidding...you were quite emphatic in your demand that Rush be turned down "below zero!" on the appropriate thread a couple of months ago, I thought the sudden invocation of Geddy Lee was kinda funny. But yeah, cool performance.